A product of Mariupol, Mykola Shaparenko became the second youngest scorer in Ukrainian Premier League at the age of 16. He was then signed by Dynamo Kyiv in 2015, and Mykola Shaparenko made his first-team debut for Kyiv against FC Zirka Kropyvnytskyi in November. After making his Ukrainian Premier League debut the previous season for Mariupol at the age of 16, it was becoming clear that Shaparenko could and would become an essential player for Kyiv. Dynamo have a long history of being a club to produce stars. Players such as Oleh Blokhin, Vladimir Muntyan, Andriy Shevchenko, and Oleksandr Shovkovskiy, Dynamo Kyiv have a history of producing and developing players. While they weren’t products of Dynamo, players such as Volodymyr Veremeyev, Igor Belanov, Leonid Buryak, Serhiy Rebrov, Oleh Husyev, and Andriy Yarmolenko, all established themselves as key components of the clubs success and saw some of their best football during their respective years playing in Kyiv. Watch the biggest games Europe. Book your custom European football travel tour by visiting Nickes.com! With three Ballon d’Or winners associated with the club, two of whom were products of the Dynamo youth system, it’s expected that the Ukrainian club will produce and or develop Ukraine’s next big player. Since the retirement of Andriy Shevchenko in 2012, Ukraine has lacked a player to carry the torch of the greats of yesteryear. While players such Andriy Yarmolenko and Yevhen Konoplyanka, who was developed by Dnipro, were slated as the next big thing, both players have struggled to adjust to life outside of Ukraine, resulting in their careers not developing as expected. 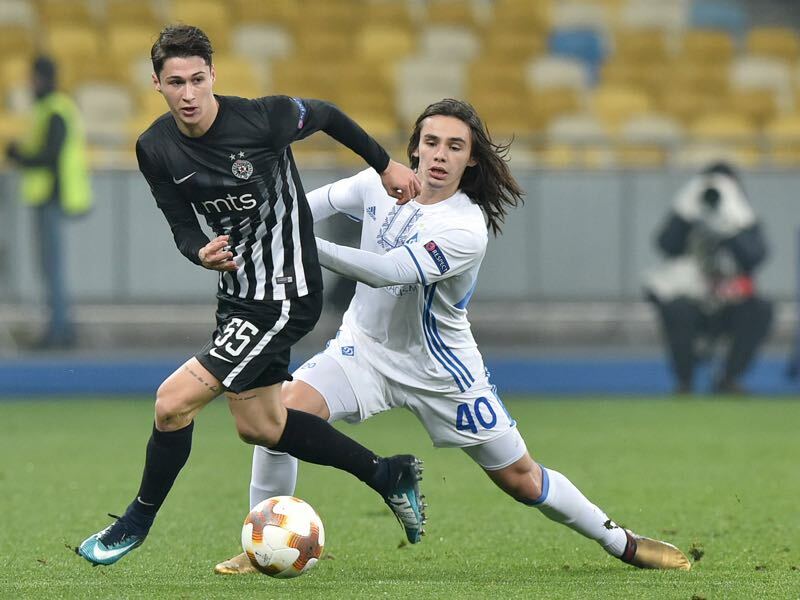 The stagnation period at Dynamo Kyiv has seen the Ukrainian club look to a variety of outlets in order to overcome the difficulty they currently face. With Shakhtar Donetsk continuing their dominance in the Ukrainian Premier League, Kyiv must adapt. Youth is an intrinsic part of football, Mykola Shaparenko has found himself increasingly playing an ever-expanding role at Kyiv. Primarily featuring at youth level after his first team debut in 2015, Shaparenko made his breakthrough during the 2017/18 season. Lacking attacking prowess to support and combine with Viktor Tsygankov, Shaparenko proved to be the ingredients Dynamo had been looking for. While only featuring in eight games during the 2017/18 season, Shaparenko showed glimpses of what he could do. One goal and two assists in the Ukrainian Premier League, the Ukrainian talent was on course for an important role at Dynamo Kyiv. Suffering a fractured collarbone towards the end of the season, Shaparenko’s season didn’t go as smoothly as one would hope. Despite the injury, missing a handful of games in the Ukrainian Premier League, Shaparenko continued to feature for Kyiv, playing a role at the end of season victory against Shakhtar Donetsk. The 2018/19 season would be one of great importance, a season in which could cement his role at Kyiv and continue his progress and development. Playing a total of fourteen games in all competitions so far this season, marred by an injury at the start, the midfielder has hit the ground running. Scoring five goals and playing an important role in Kyiv’s creative and attacking ability, Shaparenko is pivotal in establishing the link between midfield and attack. With Dynamo Kyiv struggling to finish games and often faltering in defence, the importance and reliance of Mykola Shaparenko, alongside Kyiv’s other diamond in Tsygankov, is elevated. The improvement has been evident when looking at this statistical numbers in comparison to last year. Last year Mykola Shaparenko averaged 0.08 goals per game, this year that number has gone up to 0.59 goals per game (all senior competitions). More selfish in front of goal Shaparenko is now more dangerous when going forward having improved his shots per game from 2.3 to 3.32 with 57.7% of those shots on target. A dribbler Mykola Shaparenko has averaged 4.75 dribbles per game this season of which he completed 61.7%. Mykola Shaparenko – A move abroad to make a step forward? When watching the 20-year-old from Mariupol, there is a sense of romanticism. His ability to create and establish plays reminds fans of yesteryear. Entering a period of stagnation and uncertainty, a team adored by many is finding itself looking for a diamond to take Kyiv out of the rough. Once the club of glory, the current period at the club leaves the prospect of talent leaving almost inevitable, in a season which is arguably one of his most important, especially in progressing as a player, Mykola Shaparenko may look at the prospect of venturing out of Eastern Europe to take his career to the next level. Represented by ProStar, an agency that primarily has Eastern European clients, Shaparenko is well situated. Featuring players such as Andriy Yarmolenko, Ruslan Malinovskyi, and Valeriy Luchkevych, Ukrainian players who have made the move further afield, Shaparenko has the opportunity and ability to venture into the bright lights of Central and Western Europe. For the benefit of his career and fulfilling his potential, the diamond of Dynamo requires the path of those who went before him. In a climate where Ukrainian football is faltering, it’s a question of when not if Shaparenko leaves Dynamo Kyiv.